Finally, after a long and anxious waiting, the second in a trilogy of films based on J.R.R. Tolkein’s popular masterpiece The Hobbit, has been released on theatre. 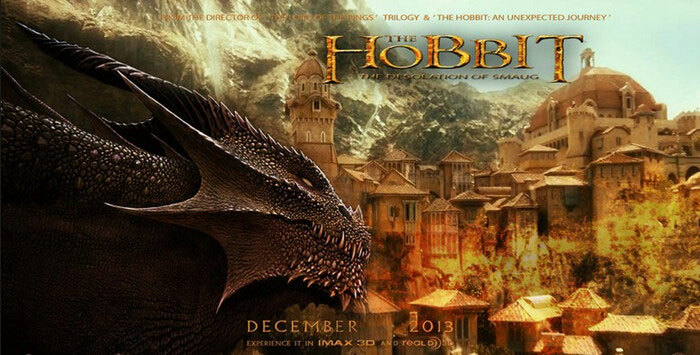 The Hobbit: The Desolation of Smaug has been a smash hit at the box office in North America. At this post we discuss more about The Hobbit 2 DVD and also want show you how to easily rip DVD The Hobbit: The Desolation of Smaug without quality loss and transfer it to any mobile device including the latest iPad Air, iPad mini 2, PS4 and Xbox One. Enjoy your favorite DVD new movies with friends or when travel out! We haven’t heard any official announcement about The Hobbit 2’s DVD release date yet, but it’s estimated for March, 2014 at the earliest. The Desolation of Smaug is the second installment of the three-part film series, beginning with An Unexpected Journey (2012) and set to conclude with There and Back Again (2014).In this movie, we see Bilbo (Martin Freeman) and the dwarfs continue with Gandalf (Ian McKellen) on a quest to take back Erebor. In order to do so, they need to reach the city and break into its walls, allowing Bilbo to sneak past a fire-breathing dragon to bring back the Arkenstone. Along the way, we meet some elves (including Orlando Bloom’s return as Legolas) and a human bowman named Bard (Luke Evans). As most commercial DVDs are added high-tech copy protections, we always need the DVD ripping tool to work on the DVDs we bought. Most of us are familiar with the pop open source HandBrake, but we all know that it couldn’t copy protected DVDs with a third party program. And moreover, many of you must have encountered some common HandBrake errors, such as No Title Found Error, Cannot Attach Subtitles, Video/Audio out of Sync, Crashes on Windows 8 OS, etc. So instead of searching tips on how to rip DVD The Hobbit: The Desolation of Smaug with HandBrake, why not try this advanced HandBrake alternative? 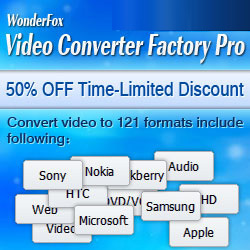 WonderFox DVD Video Converter is considered as one of the best alternative to HandBrake so far by many users. It supports all HandBrake key functions, but acts better. 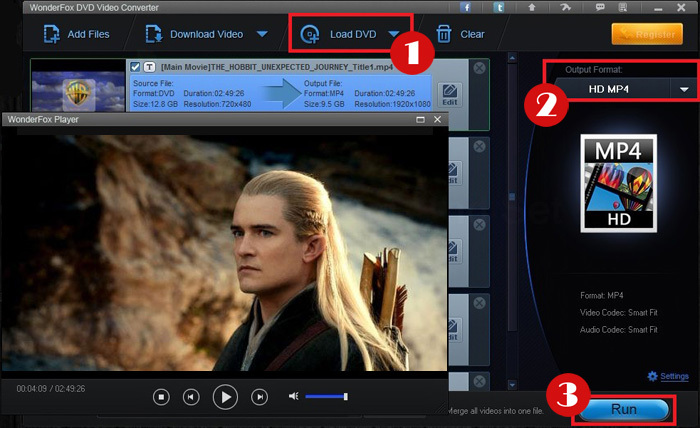 With this toolbox, we can not only backup or copy DVD The Hobbit: The Desolation of Smaug or any other latest DVDs, but also enables us to download our favorite videos, movies from YouTube, Metacafe, Vimeo, etc and convert any video audio files. Besides, we can get a free video editor to retouch DVD or video. Preparation: Make sure you’ve downloaded the DVD Converter and installed it on your computer successfully. The install process is fast and clean. Open it now. Let’s start to copy DVD The Hobbit: The Desolation of Smaug. Step 1: Insert the DVD disc into the computer DVD-ROM and then click “Load DVD”. Select “Main Movie” or “All Movies” as you want. Note: The DVD chapters of the DVD can be identified automatically. And two choices will be offered: to rip the Main Movie or All Moves. If you choose All Movies, you are also able to check or uncheck some certain chapters. Step 2: Open output format dropdown list on the right side of the main interface. Select a video format or device as output profile. Note: The program can convert DVD to any video format including HD video formats. And if you want to convert DVD to your portable device and don’t know its compatible video and audio formats, don’t worry. WonderFox DVD Video Converter has already set the proper parameters for almost all devices, for example, Apple devices(iPhone 5S, iPad Air, iPad mini, Apple TV and more),Samsung GALAXY series, Nokia models, BlackBerry models, HTC, PS4, PSP, Xbox One, Xbox 360, etc. Step 3: Simply click “Run” to begin to rip DVD The Hobbit: The Desolation of Smaug. In the shortest time, you’ll get The Hobbit: The Desolation of Smaug DVD copy with zero quality loss. See? It’s so easy and quick to backup DVD The Hobbit: The Desolation of Smaug to any device for convenient playback at anytime anywhere. And of course, any other latest DVDs can also be copied, such as Carrie, The Hunger Games 2, Thor 2, We’re The Millers, Grown Ups 2 and any more. By the way, WonderFox soft is now offering crazy discounts, up to 70% off the normal price during 2013 Christmas promotion. Check now to see if there is a proper Christmas GIFT for your family or your friends! Want to enjoy a happiest Christmas with your kids? Start a sweet holiday tradition with watching best Christmas movies for kids with family. We also give you a list of Christmas movies for children. Frozen proves Disney’s return to the animated greatness. If you want to know better about Frozen and get a copy of DVD Frozen, you come to the right place. Still trying to find the best solution to convert DVD to iPad mini 2? After reading the tips, you can play any DVDs on iPad mini 2 freely.